Ninai waterfall is one of the most adventurous travel locations in Gujarat. 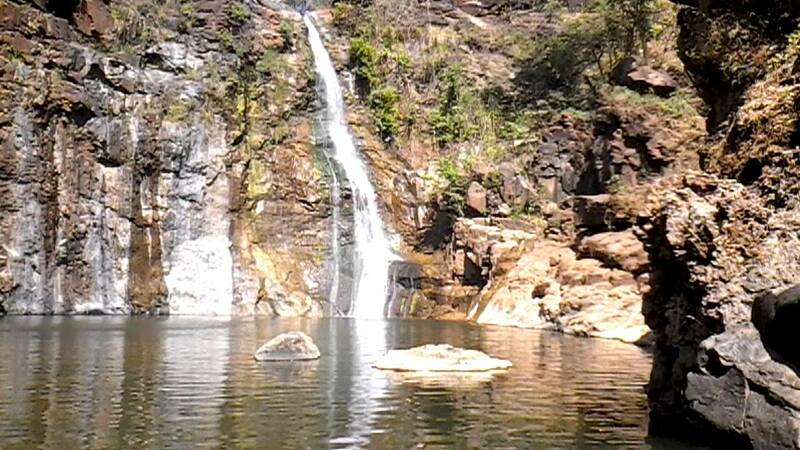 Situated in Dediapada taluka, this waterfall has not only scenic beauty but also has a wildlife sanctuary attached to it. Dediapada taluka is located in Narmada district and the waterfall is sited 143 kms away from nearest city Surat in Gujarat. Ninai waterfall is 30 feet high and is said to be one of the largest falls in Gujarat. Dediapada is the nearest town so expect some budget hotels there. Also you will find campsites, lodges, and eating hubs near the falls where a weekend can be spent with friends and family. Ninai waterfall is a perfect place for trekking, rock climbing, camping and water rafting. Also the place has several valley view point where you can enjoy the natural beauty. Waterfall, temples, wildlife sanctuary, adventurous sports – Ninai has all these to offer. Ankaleshwar is 10kms away from Bharuch, the place has 133 years old bridge over the Narmada River. There is also a jain temple and other heritage places to see. Malsamot is a hill near Ninai waterfall. The foothills of the place are picture perfect and definitely a treat to the eyes. Also the Sardar sarovar dam i.e. 128 meter long dam situated near Narmada ricer is a splendid thing to watch near Ninai. People may opt to go around the Shoolpaneshwar wildlife sanctuary where animals like leopard, barking deer, pangolin, sloth bear and a wide variety of birds can be found. For the religious travellers, Surpaneshwar Shiva Temple is among the most famous religious travel spots near the Ninai falls. It was demolished while constructing a dam near it, but remodels it for the devotees. By Air: Surat is the nearest airport form where you can get in there. To reach Ninai, take taxi or bus from Surat airport. By Rail: Bharuch is the nearest railway station from Ninai waterfall. Take a cab or bus to get in there from Bharuch. By Road: Ninai is situated on the highway which is 35km away from Dediapada taluka. So this place is very well connected by roads. To get in there you can take taxis, buses and also hire cars from any city in and around the state. Between November and February is the best time to visit the place as the temperature revolves around 15 degree which is definitely a pleasant weather to enjoy the beauty of one of the beautiful travel destinations in India.